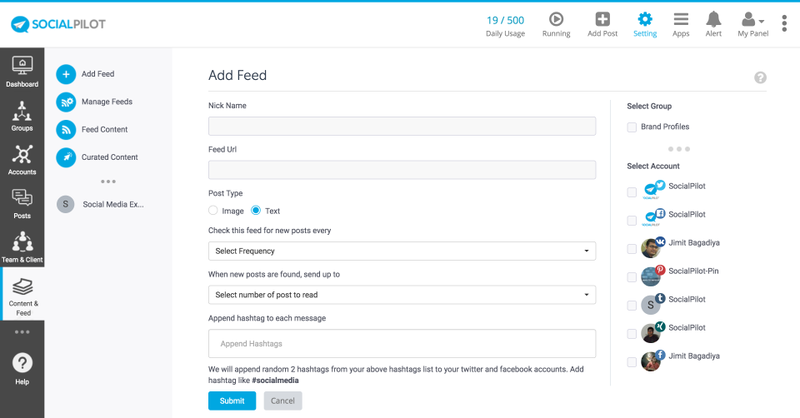 Manage all of your major social media accounts and improve your social media efficiency on one platform with automated post scheduling and many other unique features. SocialPilot is a social media scheduling and marketing tool for social media professionals and digital marketers! Schedule your posts to social media networks like Facebook, Twitter, LinkedIn, Google+, Pinterest, Instagram, Vk, Tumblr and Xing. The best tool in our social media arsenal hands down. Pros: Their bulk scheduling features are outstanding. Huge time saver over the competition. They also have a really nice "reporting" system which alerts you if there is a problem with a post or a network error on one of the social sites. It's incredibly easy to add users and their accounts without having to request their credentials, simply send them an email and it's click bam boom we're in business. They have a new video feature which is convenient and also have added a content curation feature which seems to be getting more intuitive every day, also nice. Their support is spot on and always available and they are willing to do hands on training for staff members as they come on board. Really impressive. Cons: If they had a bit more of a "listening" or "engagement" feature set this would be probably the only tool you would ever need for social. If the video portion wasn't limited to just uploading and could capture the video and post from a link that would save some time, but I'm sure they are working on it as we speak! Overall: The benefits are on going, the best part was the ease of onboarding team members and the high level of support we continue to receive from SocialPilot's team. Significant increase across the board in social engagement, increase in followers and conversion from social to our primary destinations. Wow! You are awesome!! Such an amazing review from our user is more than valuable to us. You have appreciated SocialPilot in such a wonderful way. Thanks so much. Glad to know SocialPilot proves to be the one platform you would love to use for your social media marketing. We know listening and monitoring are quite needful. We'll surely have a word with the developers about this. Pros: The groups feature is huge, allowing me to post to a specific group of 20 or so accounts, but leaving a different set of 10 accounts off the post. The bulk upload works. They could make a sample template that is a bit more explanatory. The pricing, should it remain unchanged, rocks. I don't understand the greed at a few of their competitors. Pretty good analytics too. Overall: I can manage the social media accounts of 25 real estate agents, and with bulk scheduling, get months of posts lined up in a day. Great value, and they offer an intro training session for free, which was mostly helpful. Really glad to know you almost are getting everything right, using SocialPilot. We understand the need of Instagram Direct Publishing since their API is out now, but to have that feature you need to be partners with Facebook and there's a whole procedure to follow being Facebook Partners. We are on it working on the process and will soon have this feature. Pros: Social Pilot cheaper than most SM Management software in the market, and can be a cheaper alternative to Buffer and HootSuite. Cons: I really dislike the fact that my "country" supports the free plan and paying for upgrades but doesn't support the free trial. 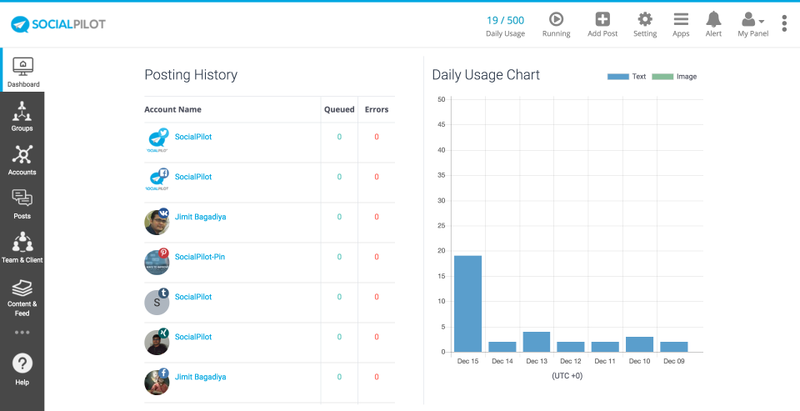 Overall: Social Pilot is a simple social media management tool, I decided to sign up for the free plan to get a feel of the software, in comparison to other SM Management tool. The signup process was easy and I linked my Tumblr, Facebook page, and twitter profile, after which I added my daily posting schedule to each SM account. I liked the Pinterest and Instagram option available. Other accounts SM profiles allowed includes: LinkedIn, Google +, VK and Xing. Social pilot works like buffer and Hootsuite. To test the feeds feature I had to upgrade my account or start a free trial, sadly, I couldn't start a trial because of' 'Sorry trial membership is not available in your country.' It seems rather ridiculous that upgrades are allowed in my country but the trial isn't? I can't say I've had this experience with any other SM Manager. The content curation didn't really provide me with relevant posts as I was testing this on my book blog and there wasn't any entertainment or literature option among the suggested posts categories. In comparison to other social media managers such as Buffer, Hootsuite, Swift Social and others, Social Pilot doesn't really stand out. Its strong point, however, is its cheap price, the basic plan is $4.99 compared to buffer and HootSuite's $9.99. And while I think it has a lot of potential, it still needs a unique feature that would distinguish it from other softwares in the market. Thanks for sharing your review. The reason for not having a trial in few countries is that, we have some past spamming history from such specific country users. A genuine user's like you, send us a support request for trial activation and we normally activate that. Feel free to email us if you want to access the trial. We have added many unique features like social media calendar, bulk scheduling, custom FB branding and we are still making our tool more usable. Once again, thanks for our review. Keep sharing your feedback to our support email address and we are more than happy to answer you. Pros: I like the ability to schedule repeat social posts. The posting of text and media to Twitter, Instagram and Facebook works really well. The ability to see posts that have been delivered and manage the schedule of you posts also works really well. Cons: The interface needs work. Some simple things like allowing click through on the sub menu items such as 'Manage Posts' (not just the text) and not picking up the profile pictures for the accounts make the interface feel as if it isn't being assessed for improvement that often. It also no longer posts to LinkedIn very well, posting a link rather than the original post image (although this might be more to do with LinkedIn's API than anything to do with Social Pilot. It's really disappointing that it doesn't offer management of followers for Twitter and doesn't give very basic analytics on the individual plan. Thanks for your SocialPilot review. Glad to know you like the Repeat post feature and the ability to manage posts once it's delivered. But it's despairing to know that SocialPilot doesn't fit well to your requirements. We are working on making SocialPilot better each day and are bringing updates and advancements very frequently. Instagram direct posting, we are on it and will soon be available at SocialPilot. About LinkedIn you said it right, we can't help it. It's how LinkedIn API allows any third party tool like SocialPilot to do. Hope we can make your SocialPilot experience better. The best publisher of social network manager. Pros: It is very easy to use and intuitive. It has many functions that I can not find in other publishers, such as: it allows you to publish the same message for several days. allows you to search for content to cure, allows you to schedule publications of other feeds, allows you to make publications with links directly from the images, among many other great functions. Cons: It is very easy to use and intuitive. It has many functions that I can not find in other publishers, such as: it allows you to publish the same message for several days. allows you to search for content to cure, allows you to schedule publications of other feeds, allows you to make publications with links directly from the images, among many other great functions. Overall: Although nothing is perfect in this life, it needs a few functions to be perfect. as a hashtag search engine, upload several images in bulk and that you could create several different publications among other things that would come to you very well. Thanks for such a wonderful SocialPilot review. It's cheering to know SocialPilot has made your social media marketing much easier and you find SocialPilot to be intuitive. We definitely agree nothing's perfect and that is the reason we are always on the run to make SocialPilot a better tool each day. Pros: Social Pilot is one of only a handful of similar products that offers integration to tumblr as a standard which was vital in my choice. The subscription price points are excellent value for money and allow for growth as and when needed. Cons: Bulk upload of postings is not as a easy as one would like. There are two options: 1. Uploading without specifying a posting date and time where by the system will send you're posting in the order of the upload file using a configurable schedule which you define or 2. Uploading specifying the date and time for the post to be sent. The later I have yet get working. Overall: Social Pilot have been a god send to my business. They are constantly adding new features and run regular online events offering insight, training and best practice. The guys can not do enough to help you. Thanks for your amazing review. Glad to know you like SocialPilot and is value for money! Thanks for letting us know Bulk Scheduling was giving you troubles. We'll surely look into it as there a lot of users who love this feature and how easy it was for them to upload bulk posts. Thanks for your kind words. We are always on the run to make SocialPilot a better tool each day and users like you motivate us to do more. Pros: The easy of use and the ability to have team members handle different social accounts and one team manager that can approve the posts. Cons: I really would like to have more statistics in the software. Overall: I've been using SocialPilot with my team as we've tested some other services that will help us schedule and review the publications we make on social media. After testing more than 7 different services, we will stay in SocialPilot (and that's why I'm doing this review). Here are a few things I find interesting. 1) Scheduling on Instagram. Right now this is not possible in almost any platform, Instagram doesn't allow other apps to post on them. But the way SocialPilot does this is by reminding you at the time the publication must go, you then open the app and it copies the publication to your clipboard, you just go from the app to Instagram and everything is almost done, you just adjust and hit publish. 2) It allows me to moderate the posts. My SM crew can create the posts for every platform and me or the Social Media Manager can then review and approve the posts when they're ready, this allows us to plan ahead even two or three weeks in advanced. 3) Different team members and accounts. By having different members on my team, I can choose which member handles which social account, will helps me focus my resources in the most efficient way. Overall I'll stick to SocialPilot and I really recomment giving it a try if you are in need of a social scheduling platform. Recommendations to other buyers: Approve the posts from the app. It's really easy to just swipe right when you want to approve something. Woww!! That's a pretty much detailed appreciation! This delights and encourages us more to work hard and make it a better tool for you each day. Glad to know Team & Collaborations feature is such of a use to you and is helping you ease out on your social media needs and increasing efficiency. We will pass on your suggestion where you need more statistics! I can schedule to all social platforms easily. When there is a problem, I get an email. I can add teams if I want. It does the job without charging a fortune and makes my life SO much easier. I still pay Hootsuite to publish my Instagram posts because it can do it without notifying me and having me publish it live. If Social Pilot found a way to do that, I would instantly move all my accounts to Social Pilot and never look back. There used to be a free 1-account version. I always recommend social pilot to people I talk to that want to manage their own social media. That option was perfect for them. Now I generally recommend something else because they really only need to schedule for 1 account. I have had errors occur on posts so they don't publish and I don't understand why. If I knew what it was, I could fix it so everything would post as expected, but I don't. I appreciate the email letting me know there was an error, but it would be nice if there were no errors. The queue feature. I never use it and sometimes I accidentally click it when I mean to schedule and then I have to go back and find the post and change it. If I schedule the same post for multiple platforms but I mess up (like the error I just mentioned) I have to go into each platform's post and change it. This may be unavoidable, but I wish I could fix all of them at once. Overall: SocialPilot has made my life easier and made my business work seamlessly. Thanks SocialPilot! Pros: - You can connect a lot of profiles from different social media accounts. - I am having a lot of problems posting in facebook profiles. Overall: Excellent inexpensive social media tool. Thanks for your wonderful review on SocialPilot. Glad to know you like SocialPilot! We are in communication with the Facebook team about giving us access to Direct Instagram Posting. We need to have the partnership to do that, there's a procedure to follow, so as soon as it's done, we'll get Instagram posting at SocialPilot. About commenting on a Team-members post we'll surely add this to our suggestions list. Also, I see that you are not very much happy with the customer support. Did you face any problem? I would like to amend of what difficulties you faced, please let me know! Pros: The software is pretty easy and straightforward to use and allows to schedule content from various internet portals as an auto feed. Overall: In case they manage to solve some minor frustrations including the fact that sat various periods scheduled posts are hold then it could be one of the best solutions and most cost effective out there. Thanks for your wonderful SocialPilot review. Glad to know you find SocialPilot to be easy and quite poweerful. Pros: Social Pilot is easy to navigate. I especially like the "calendar" option, where you can view a full month's worth of post, even segmenting by social media platform. This comes in handy, especially with Pinterest. The analytics tab is easy to read and allows me to see which days and times my followers are most engaged, without having to visit that particular social media platform. Cons: I do not mind the daily usage limitations (within my price range) however, I wish I was able to add all my Pinterest boards to my profile, although I know I cannot post to each board daily. I just would like the accessibility. Overall: I discovered Social Pilot after reaching my frustration threshold with several other social media scheduling platforms. Several were difficult to navigate; some where not responsive; the most recent software, prior to SP, could never get a grasp on their Instagram push notifications. With Social Pilot, I am able to push my Instagram notifications immediately upon receiving the convenient reminder from Social Pilot. So relieved I discovered this software! Thanks much for this wonderful review. Delighted to know you find SocialPilot easy and love the features finally you found a tool that fulfills your social media requirements. SocialPilot has allowed me to completely automate my posts on Twitter, Facebook, and LinkedIn. Pros: It has several small features that will make your life easier. For example, if you want to post on Twitter about an interesting blog post, simply copy the URL in the are for the message and SocialPilot will automatically retrieve any photo or diagram used in the blog post for you to include in your tweet. How cool is that? Cons: If you use social networks a lot, you probably noticed that some socials use many hashtags (e.g. Instagram) and some do not (e.g. Facebook). Unfortunately, if you use SocialPilot to schedule your post, there is no way to tell the system, please remove the hashtags before you post on a social network that does not use hashtags (e.g. Facebook). Thanks for your wonderful review. Glad to know it makes your life easier. We definitely understand the need of having this and that is the reason we are working on the Advance post feature, where you can create different posts for different social networks at the same time. We'll keep you posted with the updates. I love the simple, clean navigation. Pros: I tried a bunch of social marketing solutions while searching for one that fit me and my companies. In searching, I found SocialPilot. I love the simple, clean navigation. It's reminiscent of the old Facebook, so it's incredibly easy to learn to navigate, to add feeds/social pages, and to check out the graphs and analytics. Compared to their competitors, the pricing is at a great level for small to midsize businesses. The repeat posting tool is awesome for book releases and sales where we're posting the same thing for days in a row on different pages to drum up reader interest. Cons: They are still working on becoming a Facebook partner to allow direct posting to Instagram. Where most of their competitors have already either done this or worked out alternative ways of posting to Instagram, SP lags behind. As a company, we've noticed IG is becoming really popular for branding and marketing, so this is an imperative feature that needs to be sorted ASAP. Occasionally bulk scheduling fails, and there isn't a notification or queue alert to let you know something failed. A better way to quickly see where you need to do a repost to get it to go through would be a great option to add. Customer service was very helpful when I had difficulty connecting a certain account. Great since. Cons: i find it extremely inconvenient that instagram posts are not published automatically and that I need to do it from the app. Finally, I think that it is ridiculous that I can have access to curated content...and not be able to search for it. It's very cheap of social pilot to do that especially when I pay for it. I shouldn't have to double the money out of my pocket to use the search bar. It's absolutely ridiculous. Overall: I'm able to really improve our social media presence and reach. Thanks for your review on SocialPilot. Glad to know you like how SocialPilot works and automates your posts. The search box is a premium feature Delaney, so you will have to upgrade for it's usage and also Instagram has a restricted API so it doesn't allow any third party tool like SocialPilot to post directly to it. This is something Instagram handles and not in our hands. We have recently released the multiple image posts feature on your dashboard. Please check to post multiple images to the supported platforms right from the SocialPilot dashboard. Pros: This product works best for those that need a tool to monitor multiple social networks. It may not be all that useful for those who don't have more than one network. Utilize the scheduling and monitoring tools. Both are great functions of this tool. Wow, that's a great review. Thanks so much for this appreciation. Glad to know we have users like you who love SocialPilot. We do allow high quality images here from SocialPilot Deepesh, it's that Twitter doesn't allow image size more than 3MB and Facebook also compresses the image size if they are like really high resolution. Thanks for staying with SocialPilot. 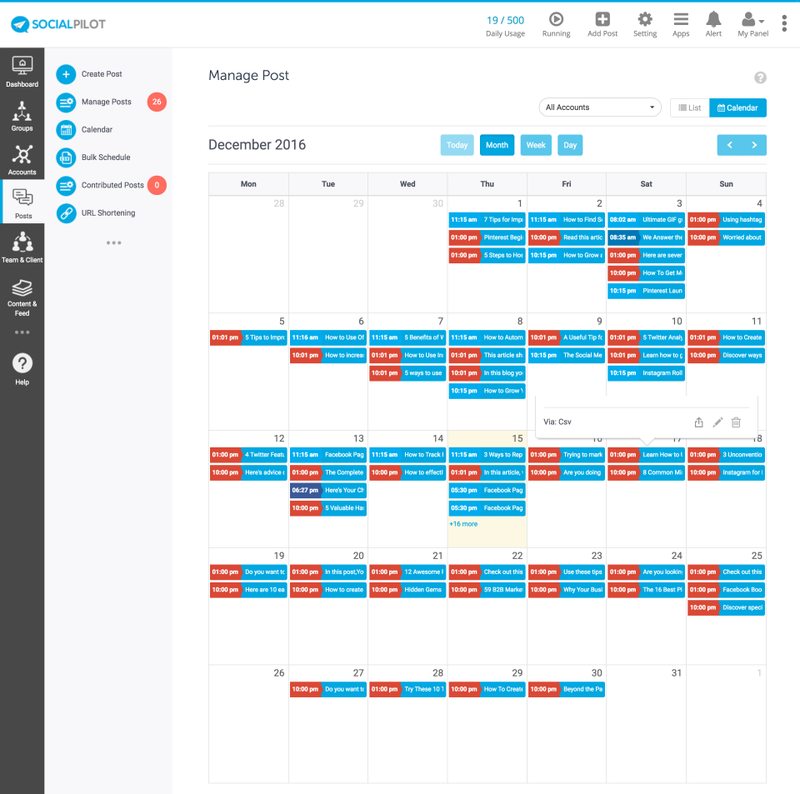 Pros: Social Pilot is tool which let you schedule and post into all social channels at the same time. My company is used to take a plan which allows us to connect all the social channels for my project including facebook, twitter, G+, linkedin, Pinterest. So I schedule my posts and the most favourable, they will ask to post as a link or image as it fetches the images from the link in caption. Cons: sometimes, we need to reconnect social media profile after some period of time as it disconnects automatically. right? I always prefer Social pilot as it has been a boon for me since past 1 year. I schedule my post by writing captions, they automatically shorten the URL and fetches the image from the URL. This is the best auto-post tool I've used in the last 10 years. Traffic to my website is increased. Pros: Ease of use. I stepped right into it and found it to be user friendly. There was very little learning curve with this Software as a Service. The website layout made my user experience relatively stress-free, which is saying a lot for me. I look for excellence and value in my online products and SocialPilot does not disappoint me. Over a six-week timeframe, my website traffic increased from almost nothing to almost 10,000 per month. This is one of the best experiences I've had in my online career. Cons: I can't use special characters. The app is slow moving on my devices. I usually use SocialPilot on my laptop but for Instagram I have to push the posts on my devices and the SocialPilot app is slower than other apps I used on the same devices. One device has less memory, one has a lot of memory, but it's the same on both - slow moving. I hope this helps. Thanks for such an amazing review on SocialPilot. Amazed to know you found SocialPilot the best tool you have used in the span of last 10 years, like wow! Great to hear that SocialPilot helped in increasing your website traffic. About our mobile app, can you please update it to our latest version? We have improved it in our latest update. You can reach out to our support team if you are facing any issues further. Social Pilot is a great social media tool! Easy to use. Pros: I've been using Social Pilot for a few weeks now (after using Hootsuite for years), and I gotta say that I'm impressed! What I like most are their ANALYTICS - by far. They save me a lot of time, they're detailed, and the reports are easy for me and my clients to read and understand. Their browser extension tool is also helpful too! Cons: My least favorite thing about Social Pilot is that you're not able to tag businesses/handles when scheduling posts. So I don't schedule posts through them very often. However.... when I contacted their support team, I was notified that they're working on this and plan to have that changed soon! So when that happens, you'll be good to go. Overall: Detailed analytics that are insightful and easy to understand. So that's my favorite feature by far! Thanks for an amazing review on SocialPilot. Really glad to know you find SocialPilot a great tool to use. We are always on the run to make SocialPilot a better tool to use each day, and comments like these gives us a boost to get better each day. About tagging people on Facebook, Kristyn this feature will now not be available on any third party tool, as Facebook has made certain changes in their API policy recently and we unfortunately had to stop working on this feature as we didn't have access anymore. But we are soon going to release some features which will interest you. Pros: The "Group" function is great. You're able to assign social media accounts to their own group, so having a broad overview of what you're posting for each company on different platforms is only one click. I also enjoy the "Curated Content" which makes it easy to find relevant articles and links to share with your audience. Cons: There's still some bugs that could be ironed out and some suggestions to take into consideration. Overall: Affordable, easy to give clients access to their accounts and to give team members access to specific groups. Thanks for your wonderful review on SocialPilot. Glad to know you find SocialPilot a simple tool to use and the features to be intuitive. We'll definitely add these suggestions to our list. SocialPilot is a MUST for our Business! Pros: It's very easy to use. Creating and scheduling social media posts across a large number of networks is simple and to the point. Very intuitive to teach my team to use it as well. Cons: The cost is a bit high but all in all -- well worth it for what it delivers. But like anything, cost is always under consideration when using tools. Overall: My business manages several different companies social media accounts. We simply post from Twitter, Facebook and G+ using SocialPilot! It's soooo simple. We also use it to schedule posts at different times which is one of my favorite features. Overall, our experience has been solid. Due to cost, we left socialpilot several months ago... But quickly realized it was a necessary business tool for us so we re-subscribed. Now we are likely lifetime customers. Thanks socialpilot and keep up the great work. Pros: Easy to use, no unnecessary learning curve for managers, team members, and customers due to the design of the user interface. Set up and scheduling can take place immediately, once an account has been created. Less bulky as some of its competitors. Cons: Perhaps there are too many benefits in the sense that clients could possibly learn how to perform social media marketing software and decide they could do their own work without the need for a freelancer. Otherwise, this software functions as described. Overall: SocialPilot saves time and resources by allowing bulk uploading and scheduling of posts. Clients feel involved and given a sense of ownership (for those who want this level of participation), by seeing how their information is being managed. Wow, thanks for being such a wonderful SocialPilot user and for your awesome review. Excited to know SocialPilot proves out to be a great tool for you and helps you manage your social media marketing very easily. We are always on the run to make SocialPilot a better tool to use each day and having users like you is a boost to our hard work and dedication to become the most efficient tool out there. Pros: I started with this company when they were brand new and waited through some of the growing pains for new features to come. This is a great option if looking for a less expensive option than some of its competitors. Cons: This being a somewhat newer company to the game, some of there features feel like they are lacking or aren't a well polished as some of its competitors like Hootsuite. It is a little clumsy to try and post something other than text, pictures, or video. And even posting those feels a little clumsy. Thanks for your review and glad to know you are using SocialPilot since our early days. We are always on the run to make SocialPilot a better tool. We'll definitely take in your suggestions and try to make advancements and not make it look clumsy. Pros: There's a learning curve, but once mastered the software is very easy to use. It is so convenient to be able to write a blog post AND schedule all the social media promos at one time. 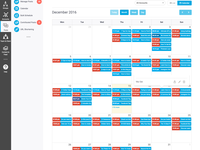 The calendar feature helps me visualize my post schedule and the drag and drop feature makes rescheduling extremely easy. I prefer to schedule rather than put posts into a queue but the times I've used the repeat post feature (publish X times in Y days) it has been easy to set up. Cons: I gave up on trying to post to Google Plus (not a real hardship, but other bloggers may want this functionality). It would be nice to be able to bulk edit posts that were scheduled at the same time, but I've learned to be double check and edit BEFORE hitting publish. Overall: Value for the money. Other schedulers with similar features are out of my budget. Now that I'm scheduling posts on a regular basis, I'm seeing starting to see more blog hits for social media. Without Social Pilot I wouldn't be able to do it. Wow, that's an awesome review! Thanks for such an amazing review on SocialPilot. Really pleased to know SocialPilot is your go-to tool for fulfilling your social media needs and you are getting results too. We'll surely add your suggestion to bulk edit posts that are scheduled for the same time. Pros: This is an excellent solution for people who have multiple clients to manage. You can request access to your client's accounts, invite them to review posts and work on their own accounts, group their accounts into groups, set automated posting schedules, import feeds, etc. Cons: This software is week on the integration side. Integration into Feedly without the use of a 3rd party tool is a major drawback. They should reach out to other platforms that agencies use to build a relationship. Thanks for your amazing review. We are glad to know you find SocialPilot as one of the best platforms. We'll surely look into integrating with more third party tools. Thanks for your suggestion. Pros: The CALENDAR feature. So needed and no one else is really doing it. I searched and searched and when I found Social Pilot, the angels sang! I recommend it to all my clients and friends. I even got my mom to use it! Delighted to have such users at SocialPilot. Glad to know you love SocialPilot and its helping you to reach your social media goals. 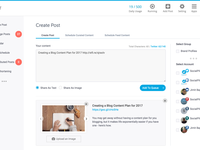 We do have the option to edit a post which you have already delivered and want to reshare it with your audience. Pros: This software is great for my boutique agency. We manage social media for our clients through the desktop and mobile app with ease. I like that it has similar functionality to buffer but is more affordable for a small agency like mine. The content discovery tool also helps us post great stuff regularly! Cons: When I chose Social Pilot, I was concerned that it didn't have direct publishing to Instagram. I shared that with the sales person following up on the trial and he mentioned they were hoping to have it by August, 2018. Here we are, middle of October, 2018, with no direct-to-Instagram publishing. I'm sticking with it for now because I otherwise love the platform, but I can't function for long without that capability. Thanks for your wonderful review. Pleased to know you like SocialPilot and is a great software for managing your boutique agency. We totally get it of how important is Instagram direct posting and we definitely are working on it. There's a whole process to follow to become Facebook partners in order to have this feature and we are on it. We apologize in the delay, but we ourselves are waiting for answers from Facebook. Hope to see you stick around, we surely will have this feature on board. Pros: The platform works very well and it's definitely tailored for all team sizes. The data featured in the app is extremely useful and easy to follow and comprehend. 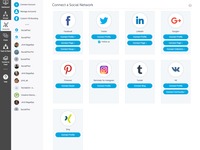 Social pilot is an essential tool for managing the reach of your company and how well you are connecting with your target audience. From here you can work to improve where needed. It's very easy to digest. Cons: Although they offer different plans, the pricing can be a bit challenging to put up with for smaller teams. Also the apps can be a bit slow and the user interface could use some improvement, as it's not as intuitive as it should be. Thanks for your review. Glad to know you like SocicalPilot and count it as an essential tool. We throw up discounts very frequently understanding the need of small businesses, so that they get the most of SocialPilot and comparatively we are cheaper than most of the tools out there. We are working on updating our app to avoid any glitches faced and constantly on the run to make SocialPilot a better and intuitive tool each day. Social Pilot Is A Reliable Social Media Solution. Pros: Interface. Easy of use. Affordability. It's a wonderful product. Cons: Bulk uploads can be a pain. Overall: I've used Social Pilot for over a year. It's an affordable solution with responsive customer service to back it up. The reason this isn't a 5-star rating is the bulk upload feature. If you enter commas into your tweets they get truncated. Makes sense, since you use a CSV file. :) The challenge for me is that I tweet so many quotes that the process takes forever. If there was any way to modify that or flag the commas in an editable format before upload, that would be awesome. Also, any Pinterest posts that I schedule prior to a post going live don't show the picture. I schedule them for after the post publication, but it still doesn't seem to pull in. Thanks for your lovely review! This encourages us to work more and make it a better tool for you each day. 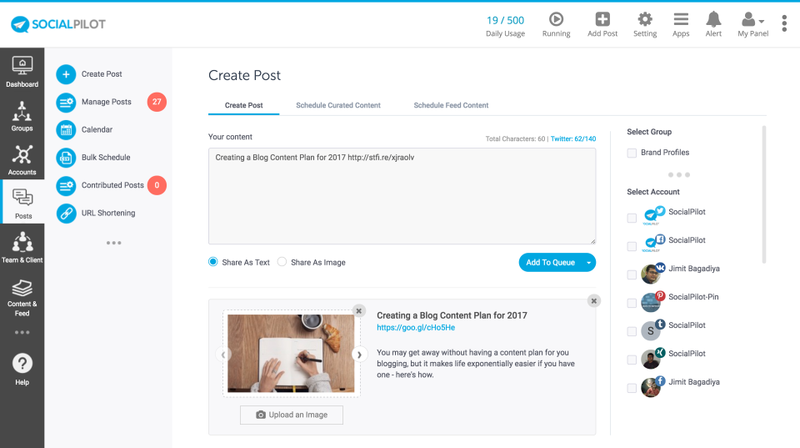 We have the feature where you can very easily edit your posts after you add a bulk schedule! Please get back to us if you need anything else. We want to make sure you are being taken care of! Comments: As the Executive Director of a digital marketing agency (www.vent2me.com.au) in Melbourne, Australia, I spent a considerable amount of time evaluating social media management tools. I trialled Hootsuite, Sprout Social and Buffer to name a few until I found Social Pilot and since then I have stuck to it. Social Pilot is excellent value of money, easy to setup and has functionality that the other social media management tools do not. I highly recommend Social Pilot to agencies and individuals who want to manage their social media with minimal fuss and cost. It is streets ahead of the competition. Thanks so much for such a wonderful review. Glad to know you love SocialPilot and it helps in increasing and fulfilling your social media needs. Pros: It is the best posting platform I have used. The price for the amount of social profiles is unbeatable. I really like being able to search for content by topic and easily throw into my queue. Canva integration is awesome too. No social feed to see posts with responses and area to respond. Overall: Overall I really like it for posting and finding content to share. I really wish that I could post videos and I also wish that I could see my posts and responses to my posts in a social feed that allows me to respond. The main reason I like SocialPilot is that the scheduling is the best out there, it allows for the separation of companies, and a ton of profiles for an extremely reasonable price. The main concern is the video posting, as I post a good amount of video (I fly drones for part of my job). The social feed I can look past because my CRM (nimble) shows comments and messages from my social media. Recommendations to other buyers: Add the two things and it will be near perfect. Thanks for your amazing review! 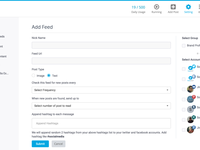 Unfortunately you can't see your social feeds on SocialPilot as we don't offer the feature of listing and monitoring! Hope SocialPilot serves your social media needs well! Pros: - Xing (German network) is included, this is a big plus. - Adding customer accounts and manage them in groups is great. Cons: not so easy to handle. some words are not well translated. shows character limits for Twitter, but not for the other networks. Overall: Of course it is a great tool to plan and pre-schedule posts. this helps a lot to reduce time. Calendar view of planned posts is great, I would like to have an easy overview per account as well. I am a marketing freelancer/Agency and will start social media management for customers in the net month. But some of my customer would like to use SocialPilot on their own. Do you offer something like a Affiliate program? Thanks for your wonderful feedback. Glad to know you like SocialPilot. We are still beta testing the language translations and we can definitely take your suggestions. It can also be great if you could help us out with words that are not well translated. We show character limit for Twitter as only this platform has very less limit. Other platforms allow long form posts. Nice to have a dashboard that is almost all-in-one for all of my social media needs for my clients. Pros: As a soloprenuer, I love that it's affordable, custom branding, content curation feature, and the customer service has been very responsive and helpful. The analytics is a great and important feature and I love that I can access/connect to client accounts without the need for their passwords. Cons: Not able to add multiple images, especially for Instagram. Would be nice to have a place to store frequently used hashtags for Instagram. Although, I love the URL shortner, it's a pain when I'm trying to include a custom URL and it keeps automatically changing to a short URL. Would like to provide deeper analytics and brief explanations of what each section means. Wow, thanks for your wonderful review on SocialPilot. Pleased to know you love SocialPilot and is a one-stop shop for your social media needs. We have just released multiple image postings to your multiple social media accounts. Please have a look, you'll love this! Also currently we don't have features where you can save hashtags or even posts for later. But that's definitely on our suggestions list and you'll have updates as there is any news about it. I switched from another program to Social Pilot at the suggestion of another author. Love it. Pros: It's easy to set a schedule so that I don't have to 'schedule' every post. It just goes right into the next slot saving me time. This ability also lets me set different schedules for different days and different accounts with ease. This is by far my favorite feature. Cons: Either I can't or haven't figured out how to tag people through this program. It can be frustrating when it comes to cross-promotion with other authors. Overall: It saves me time when it comes to scheduling my social media. Thanks for such a wonderful review. Glad to know you love SocialPilot and it helps in saving your time. Great system for Agencies managing multiple profiles ! Pros: The software is great to use, main features we like are: the ease of navigation, analytics feature, the ease of managing multiple profiles and integrating them to the system, ability to invite clients to link their own accounts and recently the export of analytics in PDF format. Cons: The system in general is great, however, there are a few features that could be added, which are: being able to add multiple photos on Facebook, the ability to have 100% white label for agencies and having a client area so they can login and see their analytics at anytime. Overall: Being able to manage multiple social media profiles with ease. Bring able to have staff accounts and invite clients to link their own social media profiles. Thanks for your amazing review on SocialPilot. Excited to know you like SocialPilot so much and the ease of functionality drives your social media needs efficiently. We have recently released multiple image postings right from the SocialPilot dashboard. Please have a look. You can do that now. And about 100% white-label that's definitely on our suggestions list and we'll keep you posted if there are any updates on it. 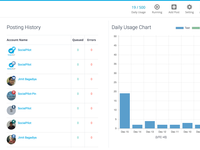 Pros: I like the ease of use and the platforms supported by SocialPilot. I would definitely recommend it. Cons: The list of platforms needs to be extended. Overall: I love how I can automate the posts at one time and just relax. Glad to know you find SocialPilot easy. I'll surely mark your suggestion down to extend, I would like to know any suggestions if you have. Pros: Lots of features. Works well. Support responds to messages oretty quickly. Overall: I'm a solopreneur who uses social media very aggressively to get the word out. After too many frustrations with a big name product, I signed up for SocialPilot. Works like a charm AND does things that others want to charge more more or are not equiped to handle as easily as SocialPilot does. Set it up and start adding content and voila . . . delivered. That's so wonderful! Glad to know you love SocialPilot so much and its working the best to fulfil your social media needs. Pros: All of the features we desire at a price point that is below other software in the market. Cons: We find nothing "con" to say about Social Pilot. We use it everyday on behalf of our clients, have done so for several months and we have not yet encountered a glitch. Overall: Excellent! We manage the social media accounts for several of our clients and utilize Social Pilot for creating several of the posts and scheduling them all. Additionally, we use the Social Pilot Chrome extension on a daily basis to share interesting content we encounter. We consider Social Pilot as one of our most useful and valued tools. Delighted to know you like SocialPilot and it fulfills your daily social media requirements. Thanks for your wonderful review and adding value to it. Pros: Ability to work with multiple clients via a single dashboard. Clients can easily see their social post calendar or come on as a team member and make their own contributions. Social pilot also provides great reports so I can spend my time working on what's important. Cons: A few benefits are missing from the Team dashboard like the ability to copy posts. This is available in the admin dashboard but it would be nice for the individual to have this option. Thanks for your amazing review on SocialPilot. Pleased to know you find SocialPilot to be the best Social posting software in the market. We'll surely add this suggestion where you can copy posts in the team panel as well. Thanks! Social Pilot has been a useful tool for small business owners. 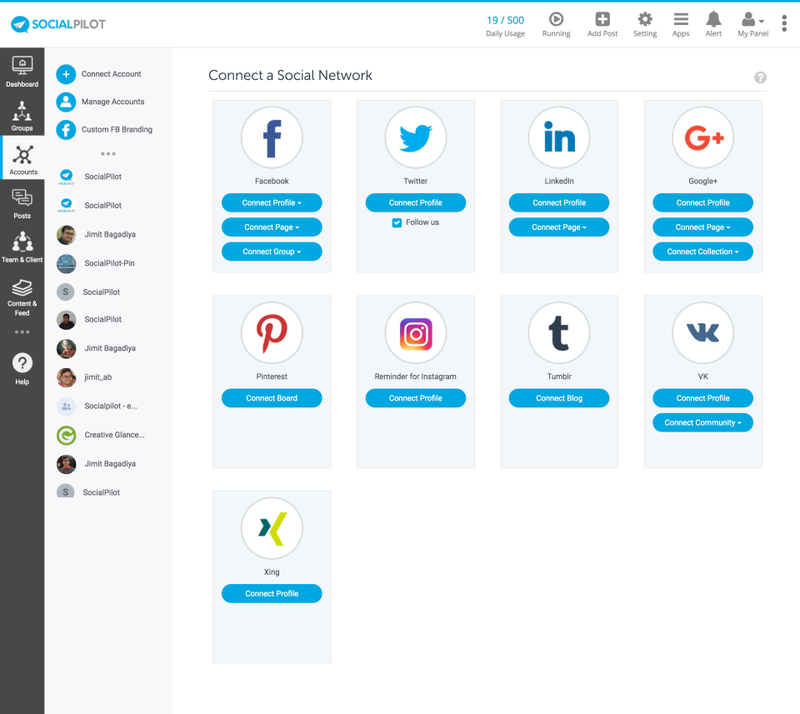 Pros: Social Pilot is very easy to use and provides a structured workflow of social media content. It allows for scheduling multiple posts at once on many different types of social media accounts, in particular, the availability of Google + and LinkedIn is useful. Cons: Social Pilot does lacks some features like content discovery, social media streams, and tracking hashtags that are provided by Hootsuite. Otherwise, it is great for scheduling and posting content to many different social media channels. Thanks for such a wonderful review on SocialPilot. Glad to know you like SocialPilot and it fulfils your needs to schedule posts for multiple platforms. Also, other features you mentioned are definitely there on our suggestions list and we'll keep you posted if there are any updates on the same. Finally the Product I have been Waiting For! Pros: Simplicity, affordability and support! Product is very user friendly and easy to learn. Cons: Really do not have anything negative to say! Overall: This product is exactly what I was looking for. I just wanted a simple application to add all my business clients social media accounts to in order to plan, schedule and analyze posts. Social Pilot is exactly that! No fancy set ups, easy account add ons, easy group set up and easy posting. If you want a simple, yet effective and affordable application to add your social media profiles to and post individually or to a group, then this product is definitely for you! That's an awesome review. Thanks much for being an amazing SocialPilot user and it is the product you have been waiting for. It's so cheery to hear this. I find it a very useful tool, to bad about the Instagram future, but they make it work. Pros: I enter my post and i don't have to think about them anymore for a while, That way i can focus on more work and without having to think about social media. Thanks for your wonderful review on SocialPilot. Glad to know you like SocialPilot and scheduling gives you free time to focus on other stuff. Please let us know how we can be of help to you, if you would like to walk through SocialPilot you can book a demo contacting manvi@socialpilot.co She'll be helping you out setting up your account and further assistance. Thanks for an amazing review on SocialPilot. Glad to know you find SocialPilot an easy to use tool which helps you manage your social media efficiently. Social media scheduling is really easy! Pros: This is the best and easiest tool for social media scheduling out there. UI is clear and easy to use from the very start. I like the customization of a post per social network . Experimenting with diferent headlines all the time. Cons: Nothing to complain about. It does what it says and is the cheapest solution. Pros: Ease of use. Great value. Time saver. Cons: Inability to maintain LinkedIn connection. Occasional errors in posting. Overall: So happy we stumbled on to Social Pilot. This service provides tremendous value and ease of use. Support is great. It's a big time saver when it comes to posting to social media. Highly recommend. Thanks much for such a wonderful review. Glad to know you love SocialPilot this much and how it's easing out on your social media needs. Can you please send us your email id you are using with SocialPilot? We'll check why LinkedIn is not working in your account. Pros: The browser extension for Chrome is a joy to use and it's a huge time saver for publishing to multiple platforms. The plan is affordable and reasonable limits. The link shortener and automatic image finding is great too. The platform posting is flawless, never had issues. Cons: They aren't an Instagram partner so you have to post to Instagram manually which is saddening. I wish that was more clear when signing up. For image heavy posts the extension can be slow. Overall: I mainly use it to save time publishing on multiple platforms. It's great and easy overall. I wish you could have a higher post limit though and I wish Instagram was supported more directly. Pros: It's really convenient that I can have multiple accounts hooked up. I use social media for multiple clients and personal projects, so it's very convenient to do it all from one spot. I also really like the calendar feature; it makes it really clear to be able to visualize it that way. Cons: Finding posts that have just gone out or are scheduled is a little unintuitive. I know it's in there, but sometimes I can only find it on the calendar app. I think making a new post and viewing pending or recently posted posts are the most common uses and should be easiest to find without searching. **Also, the Instagram feature is fine in theory (to have a notification pop up at the scheduled time with the post content, then to manually paste it into the post), but if I accidentally dismiss the pop up notification, I can't find the post anywhere. I understand if Instagram doesn't allow automated posting like FB does, but it's frustrating that I can't find an easy way to post on Facebook if I miss the notification on my lock screen. Overall: I love being able to schedule posts in advance. I take a block of time and come up with content rather than doing it on the fly with less focus. I'm able to use it across multiple platforms for multiple clients without logging out. There are a few UX/UI things I wish were different, but overall I'm really happy with the functionality of the app and use it frequently. Pros: Socialpilot allows me to post all relevant company updates and marketing content to a large number of Social Network. It comes with a large number of connectors and even supports networks like LinkedIn. That is the reason why we bought the tool. Cons: The software could be more intuitive. However, everything works the way it should. Pricing could be more competitive. Thanks for a wonderful SocialPilot review. Cheering to know you find SocialPilot to be a great marketing tool. We are always on the run to make SocialPilot a better place each day and keeping getting updates so that users like you get the full benefit of what you are paying. Pros: Simple easy to use interface. Scheduling functions are perfect! We have it up and running literally in minutes. It makes it so easy to have complete control over your social media marketing efforts. Cons: The pricing levels could have more options. Overall: We love SocialPilot! It has helped us keep our social media efforts consistent and effective. Thanks for your wonderful review. Pleasing to know you find SocialPilot to be a perfect 10 on 10. Its awesome to have such users like you. That's an awesome review. Filled my heart to know SocialPilot stands with this much importance in your life. We really hope you keep growing and increasing your social efficiency. We'll always make sure to improve and update each day that users like you can get the most of us. Thanks once again. You are awesome!